Since the house was finished I haven’t blogged much. Perhaps I need the therapy less, perhaps I’ve found other things to do. I hope I haven’t lost my blogging mojo, though. And that is why I’m making myself blog again. In the absence of a house build to generate funny situations and stories, I have found that real life more than amply fills the gaps and, over the past few months I have amassed a glorious variety of ludicrous situations to share. I’ll start with a little one from recently. We’re driving north for Christmas with a ripe Camembert. It’s a vital part of the Christmas cheese platter (baked with honey). The Kids started making vomiting noises as soon as they got in the car. We’d only managed to make it to Sainsbury’s to fill the car with Christmas food shopping and were just about to pass home again on the way out of Glasgow when I couldn’t bear it any longer and we pulled over. It seemed it was either the Camembert’s company we’d have for Christmas or the 13 year old’s, so I started trying to locate the cheese while parked in a side street in a Glasgow suburb. An avalanche of shopping and items packed for Christmas exploded from the boot of the car. Packing is my least favourite activity and mostly we divide labour in the family so swiss husband does the packing and I do things I’m good at like organising the trips. Adventures and holidays. The kids pack for themselves and have done since the age of 5. There’s a few anecdotes in that… Mainly around what one does on a winter holiday with a suitcase full of toys and summer clothes and no pants or socks. Anyway, in aid of efficiency I’d just shoved everything in. If I’d have taken the pile of wellies and trainers and a panier out and started with the boxes the pile would have been more stable. But we ended up with a load of boxes leaning outwards and bags of shopping full of bottles on the top. Despite the mess that the contents of the boot had made on the wet, puddled road, only one bottle smashed and it was the lemon chili sauce. I picked it up and looked about for a bin. There was none to be seen and so, not knowing what else to do, I sat in the passenger seat, hands covered in chili sauce holding the remains of the sauce in the upside down bottle with the bottom broken off. Turns out that chili sauce with lemon is an extremely effective deodorizer. And while I sat there, trying to remember not to run my eyes or put my hands near my nose or mouth, the children stopped complaining about the smell. It was either that or the laughing. Or it could have been the placebo effect because as soon as they discovered I hadn’t actually found the Camembert they started complaining again. When we stopped at a service station so I could dispose of the chili and wash my hands they bought an official smelly forest air-freshener. All went well until a stop for dinner at the Drovers Inn. After an hour sealed into the car, the combination of the Camembert, the Forest Fresh and the chili had fermented into an explosively stomach-churning pong. We opened all the windows, and drove, wind in our hair, ignoring the threat of frostbite in our extremities. From time to time the children would complain of the sub-zero windchill and we would close the windows. We’d last five minutes until the smell started to build up again to unbearable levels. 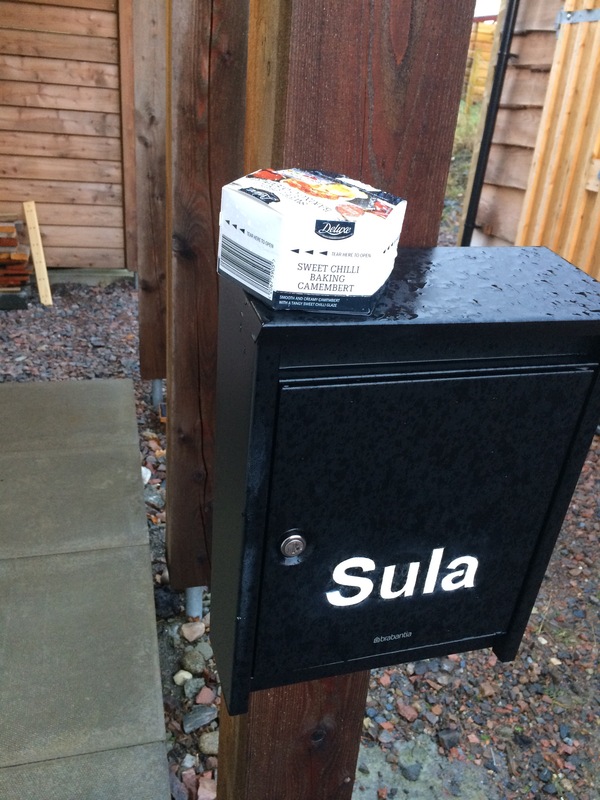 When we reached Sula and unpacked, the Camembert was refused entry and stayed outside in the mailbox. Since we are still waiting for Jamie the farmer to put up a fence around the house (materials were bought in June) we are at the mercy of Jamie’s band of marauding border collies who pop over a few times a day to check whether I’ve put out a bin bag or some other tasty titbit out by mistake and rip it apart leaving a trail of rubbish in their wake. I put the Camembert out of the way of dogs (I thought). When Christmas Eve came it was time to cook the Camembert for a wee party we were having for the neighbours. It had been knocked off the mailbox but I was relieved to find it still in one piece, untouched by the band of dogs. It may have smelled like something had died long ago while in the box but baked, it was really tasty. I resolved that the discomforts of the journey was worth it and went to bed. But the Camembert hadn’t had its last word. In the morning the 11 year old came downstairs. I was cleaning up the party but the rind of the Camembert still sat on the kitchen worktop where it had been the night before. Daughter look one wiff of it and ran over and vomited in the sink. Between comforting the daughter and cleaning her up, I took the remains of the Camembert out into the garden and buried it. I took the cardboard and plastic wrapper that had been around the Camembert out of the bin and buried them next to the Camembert. RIP Camembert…. and my New Years resolution is no Camembert in 2017. For the sake if my family. I must admit to being somewhat single minded in the past few months about the house-build. It’s been hard to think about anything else. I hope I didn’t let that cloud my judgement of what my entire family want for Christmas. Well it’s the combination of that, and a singular lack of money, brought about by the self-same house build. 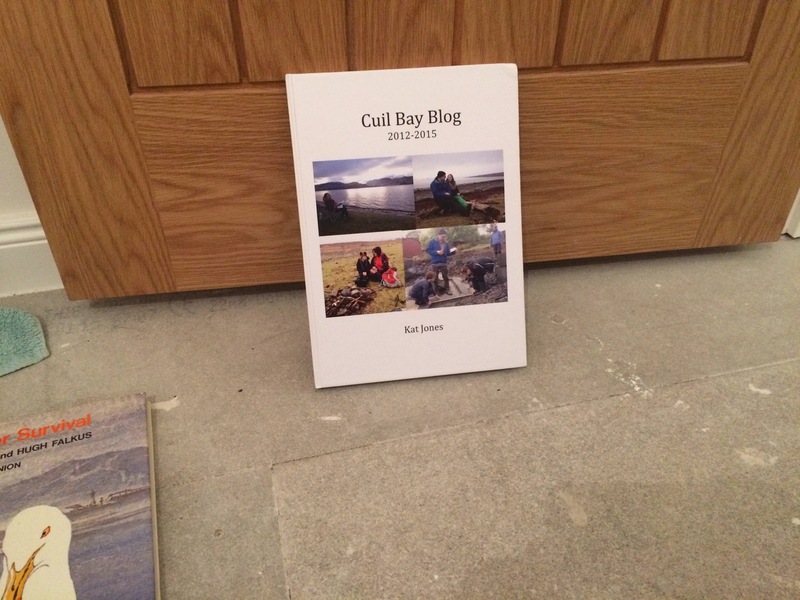 Every member of my belovèd family will get an edited, formatted and hard-back-printed copy of my blog from the very beginning. I managed to get it down to 194 pages. I hope they like it but, since my parents are my blog’s number one (and perhaps only) fans, it’s sure to get a happy welcome there. I didn’t get one for the tween-agers you’ll be pleased to know – my judgement hasn’t slipped that far. In addition to the house-build themed Christmas presents, we also had a house-build themed Christmas. Over four days we managed to transform the house into a livable space and transform it back into a building-site, every surface covered. We decorated, painted special slate worktop stuff on the surfaces, then tried to work out why it went all smeary and sticky. We put up the post box/name plate for the house, Cleared up enough dust to switch the MVHR (mechanical ventilation heat recovery) on and cleaned all the windows and frames of bits of plaster and stuff. 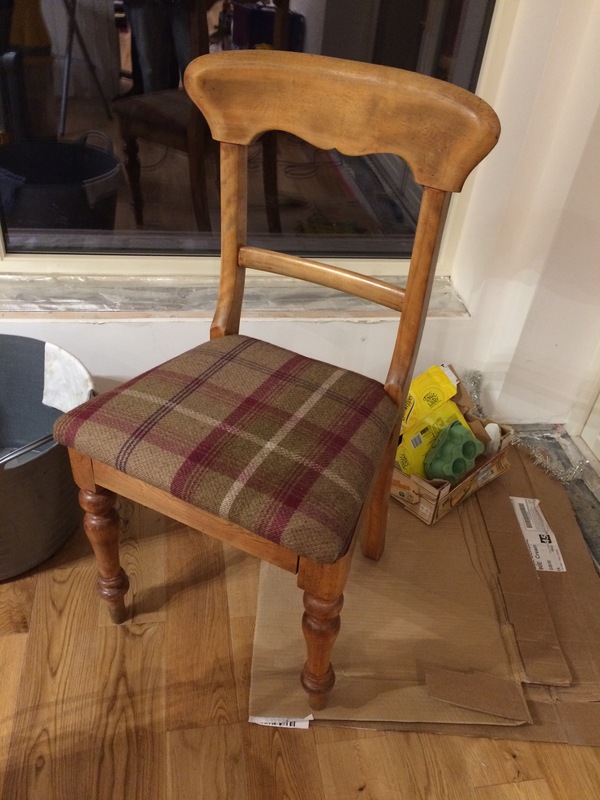 Christmas Eve was taken up with wholesome and thrifty pursuits like making plaid covers for the freebee Salvation Army cushions (granddaughter and grandmother) and upholstering the same plaid onto chairs I’d bought as an impulse Salvation Army purchase (grandpa without much input from other granddaughter). 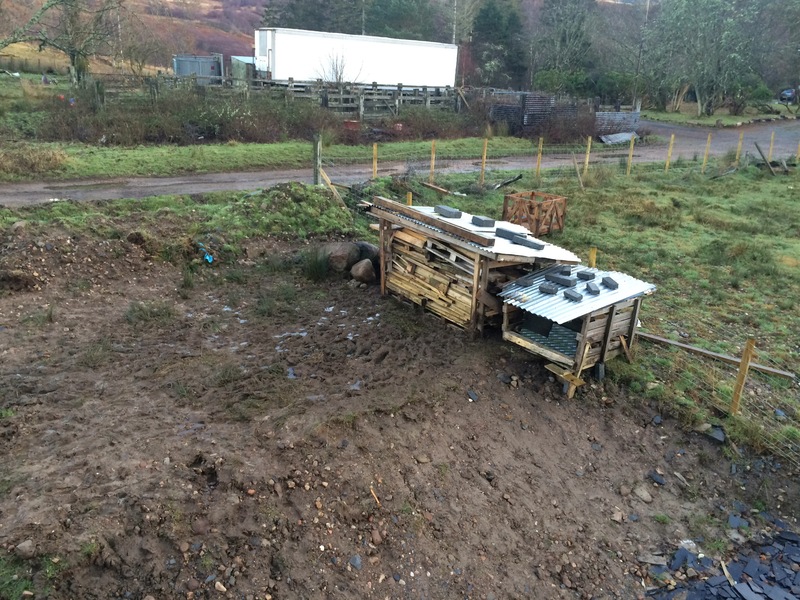 Boxing Day was all about ridding the site of wood-based detritus. 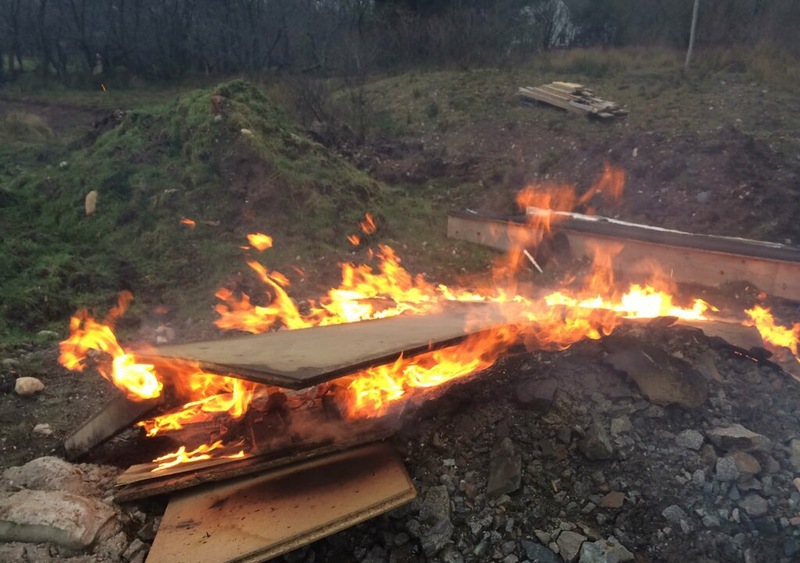 The waste stuff (water-logged chipboard, OSB and reams of cardboard) was thrown onto a pyre and sent in clouds of smoke into the ether. Farewell to the year. Farewell to a life totally taken up with this house build. Wood that could be used in future as firewood or for other things had to be moved from the enormous wood-mountain I had allocated it to at the very start of the build. I’d chosen that site specifically as the only place I could put it that I would never have to move it again. Ever. (Erm… So why are you moving it Kat?) Well you never can account for where people decided to put their water pipes in the historic past, and we discovered that one runs right under my wood-mountain and that it needs to be dug up. And we discovered it has a leak that has turned the back of the house into more of a mud bath than usual. I made some of the wood mountain into a woodshed as husband moved the wood with the concentration of a someone playing a real-life game of Tetris. Each time making the journey across a no-man’s land of mud which became more icky, more squelchy and more sucky with each crossing, until it threatened to eat our wellies whole, and some of the rest of us too. In the spirit of using the less pleasant experiences of the build for good, I’ve incorporated a memory-nemesis into that shed. 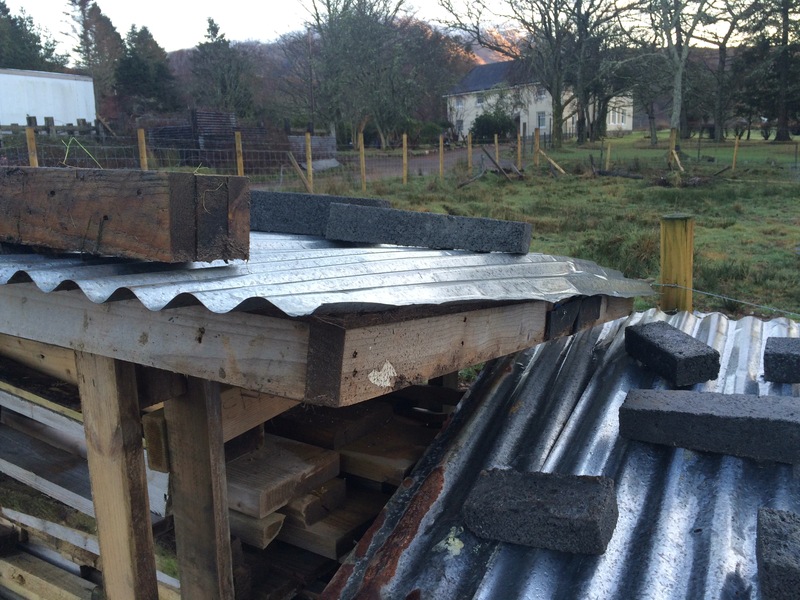 Half of the dreaded partition wall that sat for months in the newly erected and sopping wet house without being fitted and then warping beyond use is now the shed roof. The OSB wasn’t in best condition which isn’t a surprise given it’s sat in the pouring rain since April but I patched it up with bits of the Mystery OSB which is lying around in the fully-built house that no one knows what it’s for. “Don’t saw off the bit you’re standing on” I joked to myself as I sawed through a long bit of OSB hanging over the woodshed roof. Mum and dad had finished packing to leave and were hanging out of the upstairs bedroom window with husband watching progress on the woodshed roof. 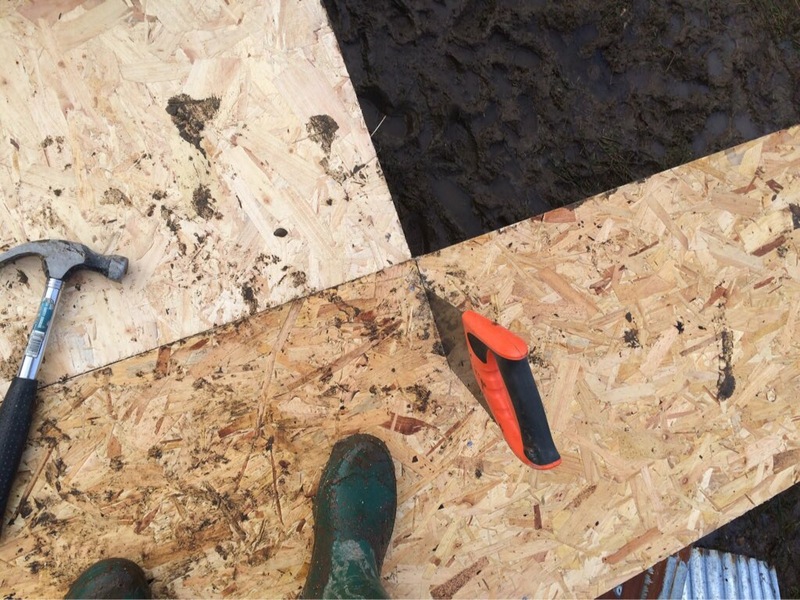 It was only a few minutes later that I forgot my own advice to myself and found that progress was easier with a foot on either side of the saw and merrily sawed away until….. CRACK!!! The saw made the final cut and I fell dramatically and theatrically into the mud-field we had created. It wasn’t quite headfirst. I am told by my audience that it would have been an award-winning bellyflop if I hadn’t landed too far over on my side. Both arms sunk up to the elbows in mud: face and hair was plastered: grit between my teeth. It was one of the funniest things that I can remember and I was consumed by hysterics (as was my audience, augmented by the kids who ran to see what all the noise was about). It was a long time before I could regain my composure enough to finish what I needed to do, strip off my dirt-caked clothes, and make my way to Christen the beautiful shower with mud and grit. 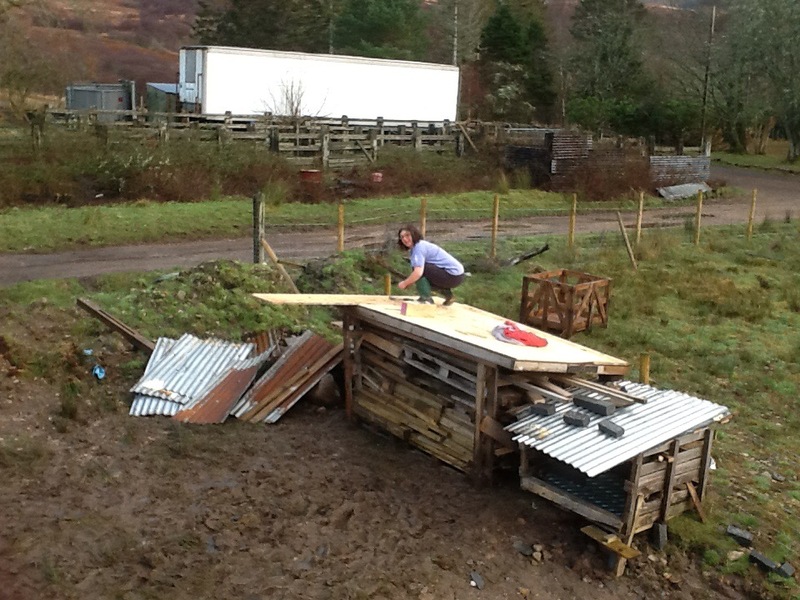 My only regret is that, although husband had taken some video of me making the shed roof, he switched off just at the moment it would have been useful to capture on film. Nevertheless, the memory of myself wallowing in mud after my cartoon-esque schoolboy error will stand me in good stead if I need cheering up in future. And, as some psychologists at Cornell University have found, giving memories rather than material presents at Christmas gives a more lasting pleasure. So perhaps Im glad that, at a time when every available penny is being spent on the house build, I’ve given such an unique, entertaining and enduring present to my whole family. A wee Christmassy take on the past 12 months on the building site now the agony is (mainly) over, the waiting is nearly finished and the joy is starting to seep in. Three feet of water …. Four walls of silver …. 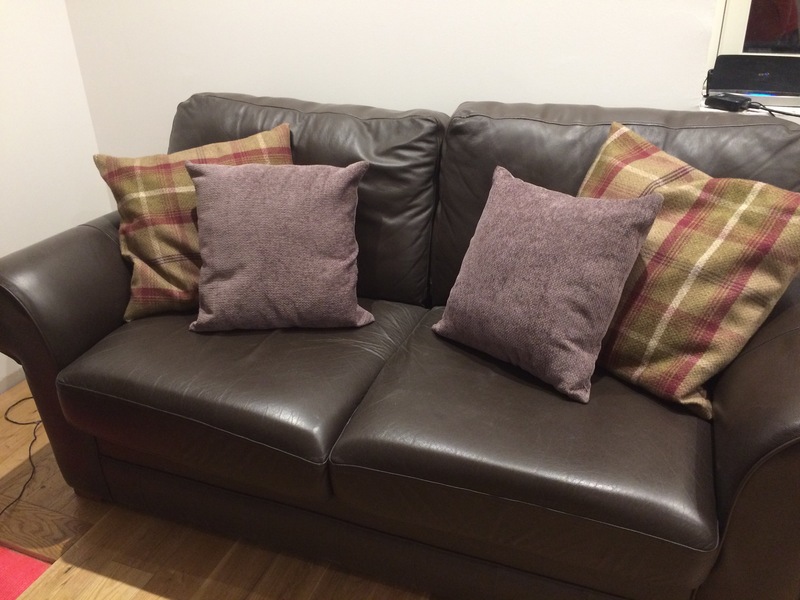 In the tenth month of building, my project gave to me: Time to sack a builder …. And a kitchen and a loo to do a wee!